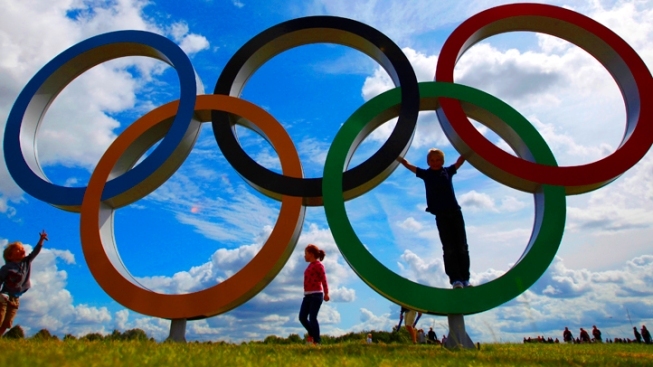 Children play on the Olympic rings in Windsor, England, at the 2012 Summer Olympics. With the 2014 Winter Games only eight months away, it's time to start getting into the Olympic spirit. To kick off the countdown, the United States Olympic Comittee is holding its annual Olympic Day festivities, a worldwide celebration that commemorates the birth of the modern Olympic Games. Its mission is to promote health and fitness while reinforcing the Olympic values of fair play, perseverance and respect. The festivities have been celebrated every year since 1948. While it is officially recognized on June 23, festivities this year will take place from June 21 through June 30. The Winter Olympics return in February 2014, when the Russian city of Sochi hosts the Games. More than 150,000 Americans are expected to participate in 715 events hosted in 558 cities nationwide. The number of Olympic Day activities in the U.S. has more than doubled over the past three years, and 2013 is set to be the largest Olympic Day celebration in history, according to the USOC. This year, more than 300 U.S. athletes are expected to participate. The events in the U.S. are heavily supported by the U.S. Olympics and Paralympics and other ther member organizations like the Boys & Girls Clubs of America. "The USOC is proud to take part and grow this global celebration by spreading the fundamentals of Olympism throughout the United States," United States Olympic Committee CEO Scott Blackmun said in a statement. Check out some events below that caught our eye and for more information on finding other Olympic Day events, visit TeamUSA.org/OlympicDay, email OlympicDay@usoc.org or follow on Twitter with the #OlympicDay hashtag. Professional, amateur and recreational speed skaters are encouraged to come and take part in three days of skating at "Skate of the Union" ending with the "Skate to Sochi" event on worldwide Olympic Day. In conjunction with 2013 "Skate of the Union," an All-Skate Party will also be held at the Anacostia Pavilion on Saturday, June 22 from 4 - 6 p.m. Participate in BMX racing to sponsored by USA BMX. Take part in a 5K race sponsored by STRIDE Adaptive Sports to raise awareness about maintaining an active lifestyle regardless of disability. Olympic events and interactive sports will be sponsored by the Southwest Chapter of United States Olympians. Participate in wrestling training and listen to lectures on traditional and Olympic wrestling. Olympic Day will be celebrated in conjunction with a new exhibit that explores the math behind sports like snowboarding and skateboarding. Olympians and Hartford residents Melissa Gregory and Denis Petukhov are also scheduled to appear. Participants can play beach volleyball sponsored by Beach Volleyball Camps, run by former professional players Sinjin Smith and Randy Stoklos. Head out to the park to participate in a wide range of sports including everything from BMX to sailing. As part of the festiivities, the USOC is honoring the 41st anniversary of Title IX, the landmark decision that provided equal opportunity for female athletes. Some events across the country will be hosted by womemn who have compted in the Olympics.